On Tuesday June 21, an evening of Kirtan Yoga was held at the gallery to celebrate International Day of Yoga. Everyone who attended participated enthusiastically in the kirtan.... and there was equal enthusiasm when a delicious supper was served at the end of the evening. Thank you to the Consul General of India, Mr Amit Mishra, for his encouragement and support for this event, which was conducted in conjunction with other yoga events organised at more than a dozen venues in and around Perth. 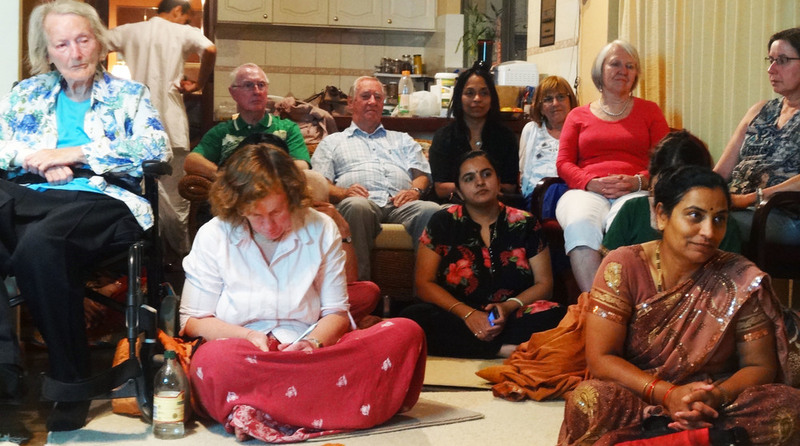 Some of you may have attended the programs we held when Jay and Kadambari visited Perth last July/August. Jay is based in Mumbai, India. He's an intrepid traveller, a keen photographer, and a travel experience designer. Lately he's been travelling in Northern India. Jay Weinstein during his recent travels. 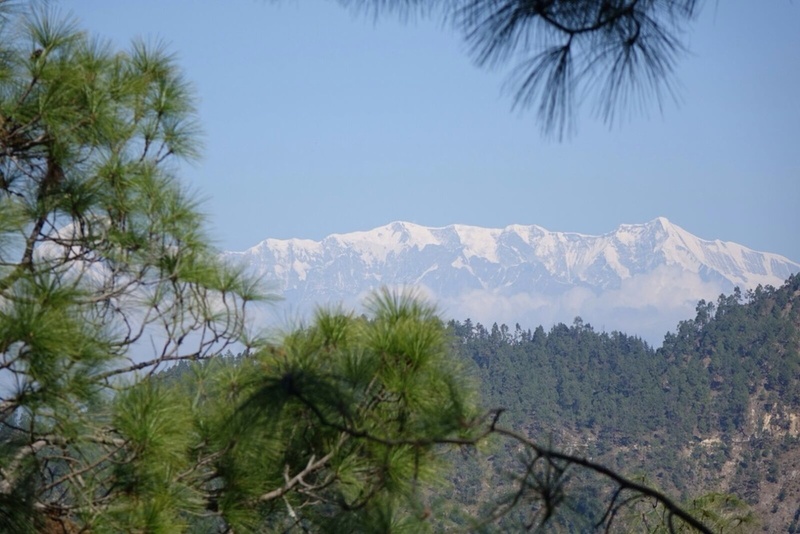 Here are some shots from Jay's recent visit to the Himalayan Mountain Ranges. The Sacred India Gallery is proud to be affiliated with Jay, and we look forward to his next visit to Perth in 2019. I'm in India, and this is the view from my room in the apartment where I reside in Vrindavan. My bedroom looks out onto a delightful green garden. Through this window I can see various trees, shrubs and a large patch of grass. The entire garden is encircled by a raised stone walkway. I regularly hear the laughter of playing children, or catch sight of someone out on an early morning stroll. I can see and hear all this activity sitting at my desk by the window. This view has special significance for me. Twice, in 2008 and then again in 2014, I was confined to this bedroom in a state of physical incapacitation. In 2008 I broke my knee, and then six years later I found myself here again with a broken ankle. Each time I was confined to bed for around 2 weeks. During these difficult periods, I sat looking wistfully out this window for hours. Monkeys roam freely in this garden, and I would hear them being chased by the guards who run along banging their sticks on the ground while making loud noises to move them on. And while children played I watched older people casually stroll along the raised pathway, and thought, "Don't they know that legs and mobility are a gift? A blessing that can be taken from us in a moment! Don't they see how fortunate they are to be able to walk and run or jump and play?" I reflected soberly on how it felt to have temporarily lost this gifted ability, and in that state of internal reflection, I somehow felt grateful for my injury. And I felt a wave of immense appreciation for my instructive window view. As my walking ability gradually returned, I retained a deep sense of gratitude for the gifted wisdom of the entire experience. And to this day, I still reflect on another gift... the unique gift of mobility. Kirtan is a form of meditative mantra music performed in many of the temples throughout Vrindavan. Some of you may know Madhava, a talented kirtan artist who travels the globe sharing his deeply devotional mantra melodies. Madhava always spends the sacred month of Kartik in Vrindavan. Every evening just before sunset, Madhava sits down under a tree beside a rajasthani gazebo and places his specially designed harmonium on his knee. Here in this tranquil setting, he chooses not to use a microphone. Accompanied only by a drum and one pair of brass cymbals, he closes his eyes and begins to chant. Within moments many people join him. The sun slowly sets. The gazebo lights up. Madhava keeps chanting. "Chant a little louder! ", he says as he himself deepens his focus on the mantra. The group steadily swells. The kirtan builds and everyone present temporarily transcends life as we know it. 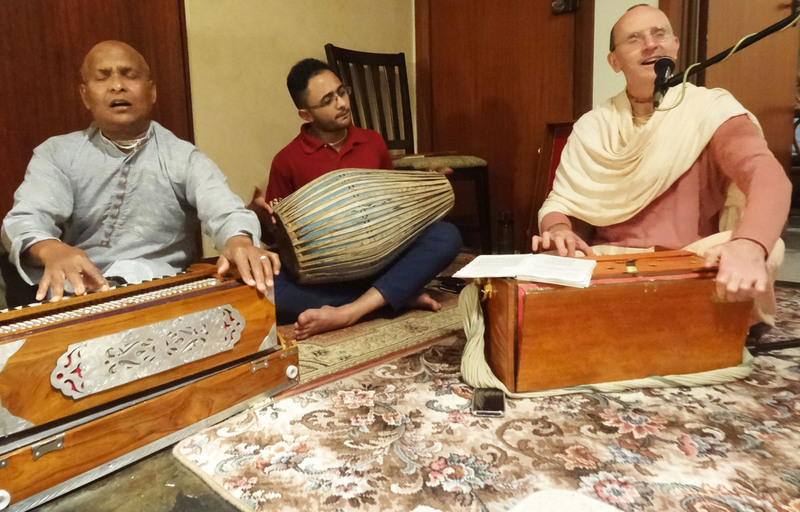 Kirtan with Madhava in Vrindavan. A special experience in a most remarkable place. Kirtan with Madhava 2016. Coming to Perth - March 11-13!! Jagattarini reporting from the sacred land of Vrindavan. You may recall a recent post on festivities taking place at the gallery during the month of Kartik. I left Perth half way through this festive month and journeyed to Vrindavan. Suddenly I found myself within the throng of happy, noisy people celebrating Kartik in this sacred land. Pilgrims packed the temple each evening seeking blessings by offering lamps with deep devotion. I was amazed to see so many people all together singing and carrying these little clay lamps. Amazingly, even with such crowds, there has never been an accident caused by fire... although one friend of mine jokingly pointed out that her hair had been slightly singed one evening. After I'd been there for a couple of weeks, the festive month of Kartik came to an end. Gone were the masses of pilgrims packing the temple each evening. Gone too were all the international visitors who flock to Vrindavan during this season. Thousands of people leave Vrindavan and return to their day-to-day life. Every one of them, without exception, making their plans to return again next year! 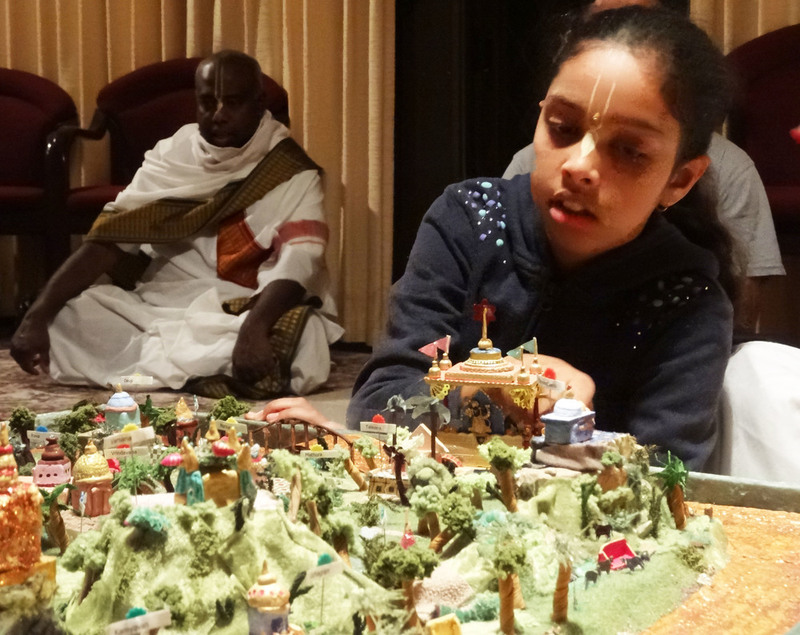 Here's a brief report on a recent gathering at The Sacred India Gallery. 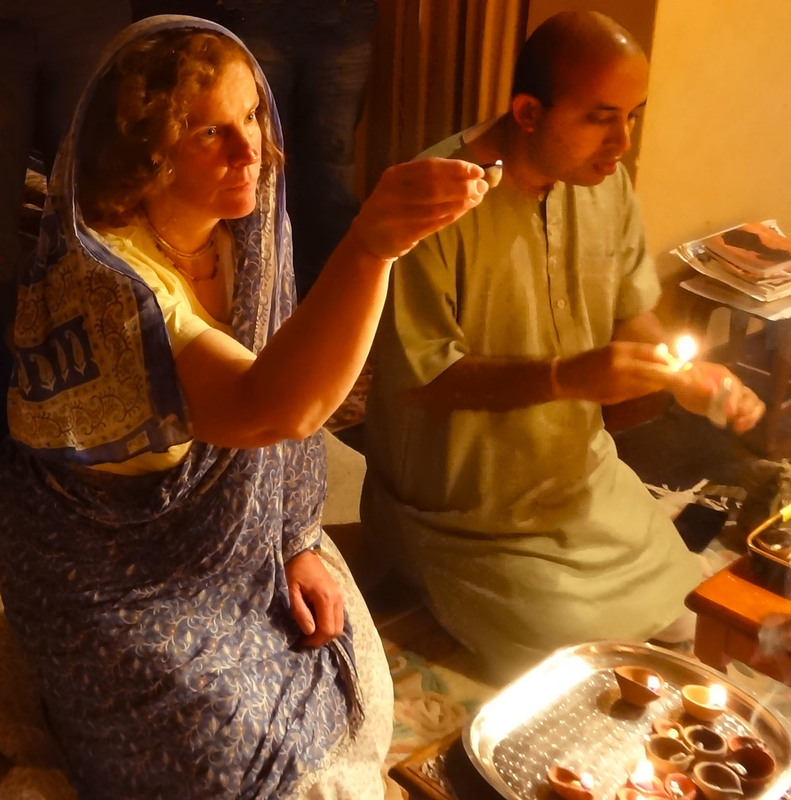 "A Night In Sacred India" is our regular monthly evening offered as a follow-up opportunity for gallery visitors who are keen for another taste of the mood and atmosphere of spiritual India. Shree commenced the evening with some breathing exercises and mantra meditation. Next we delved into some profound knowledge of ancient India in a segment entitled "Gita Wisdom". We rounded out the evening with some kirtan (devotional song) led by Marita, our good friend with a beautiful voice, from Indonesia. And let's not forget to mention the meal! Wow! Another delicious effort from our dedicated volunteers! It's Kartik time of the year again. Kartik is considered a particularly auspicious month in the traditional Indian lunar calendar. The entire month is a very festive time in the sacred land of Vrindavan. Jagattarini lived in Vrindavan for 13 years and Kartik was her favorite time of year. She recalls how thousands of pilgrims would visit Vrindavan at this time of year. Some even set out on a month-long walk around the entire Vrindavan region. The temples are full of life and festivity. Here at The Sacred India Gallery, we celebrated this auspicious month with two weeks of evening programs that captured the Kartik atmosphere. Jagattarini read fascinating stories from ancient Indian texts, and lovingly shared her memories of Kartik in Vrindavan. The evenings also featured recitation of beautiful prayers, and the refreshments were absolutely delicious! The other day, an enthusiastic group from the Housing Authority of WA made a visit to the gallery. One of our volunteers - Saloni Sharma, works at the Housing Authority and had shared several stories with her colleagues about The Sacred India Gallery. This had them all quite excited to make a "trip" to spiritual India, and they decided to spend a Sunday afternoon with us. Shree welcomed the group at the gallery as they started their sacred journey. As we passed through Mayapur and Jagannath Puri, our visitors were amazed seeing the colorful displays depicting local culture and lifestyle. Upon reaching Vrindavan, the magical miniature work of Jagattarini left the group mesmerized as they moved from one diorama to another. To conclude the visit, we all enjoyed a delicious vegetarian lunch arranged by Saloni as we sat in the serene environment of the gallery gardens. The guests thoroughly enjoyed their trip and promised to visit again with other friends and family members. This is Angela, holding in her hand a very interesting book. Angela has a story to share connected to receiving this book. Early this year she went to Nepal on a trek and while she was still in the country, a terrible earthquake hit the region. My son Jay was also visiting Nepal at that time. He happened to meet Angela, and they exchanged their thoughts on being present there at this time of calamity. The entire experience had a very profound effect on her. Soon after, I also met Angela during a visit to Melbourne. We shared very a lively conversation regarding Indian spirituality. I suggested to her that she read this book; "The Hidden Glory of India". Anyone who wants to understand the many intricacies of ancient Indian spiritual culture should read this book. Many important concepts are presented in a clear, systematic way.
" India's timeless spiritual teachings have an allure that has beckoned millions from seekers trekking high in the snowy Himalayas to austere mendicants meditating on the serene banks of the Ganges"
The "Hidden Glory of India" is available in our gallery gift shop as well as online. India is a land of festivity. And one of the most famous annual events is Diwali, the festival of lights. As described in the famous historical epic, Ramayana, this day marks the return of Ramachandra, along with his wife Sita and brother Laxman, to Ayodhya [in Northern India] after 14 years of exile. Blissfully welcoming Ramachandra, the people of Ayodhya lit lamps all over the city symbolizing the joy and enlightenment of their hearts upon his return. This year Diwali was celebrated on the 11th of November. From her days in Vrindavan, Jagattarini lovingly remembers the high spirits of the local people at this time of year. Diwali falls right in the middle of the sacred month of Kartik, when pilgrims offer lamps every evening in the many temples of Vrindavan. During the entire month, temples are ablaze with ghee-dipped cotton wicks in little clay cups. 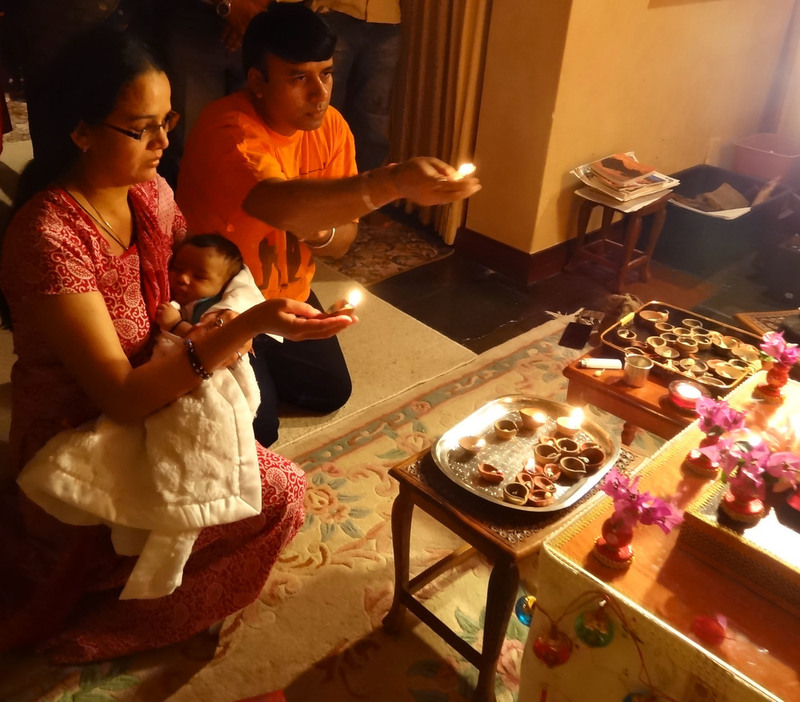 Here at The Sacred India Gallery we celebrated Kartik by offering lamps just as they do in Vrindavan. Recently, we had a visit from 7 students from the University of Western Australia (UWA) . The group were members of a Guild affiliated meditation club called Uni Mantra. The club is coordinated by Pratik Rathod, one of our volunteers at The Sacred India Gallery. Pratik invited members of the club to visit the gallery for a tour, and they were really excited to experience a "journey" to spiritual India. After the tour, we all relaxed into some mantra meditation with Shree, followed by a fantastic lunch arranged by Pratik. The students were really happy to be here and they spent the entire afternoon at the gallery. They all left with big smiles on their faces! Dana Trixie Flynn, whose Greenwich Village yoga centre - Laughing Lotus - is famous among the major yoga schools in New York City, visits The Sacred India Gallery. This week we had five students visiting from St Norberts College in Queens Park. Mia, 17, who had selected the theme for their current English assignment was personally super excited about an upcoming trip to India at the end of the year. She convinced her team to take up the challenge of producing a documentary on Indian religion, food and culture. Soon after that they found us online, rang us up, and joined us for a Sunday tour! Shree happily took them through the gallery, which they really appreciated. Jagattarini came along to take some photographs. It was lovely to share our journey with such a nice, young, intelligent group.